I will never grow tired of seeing the impact of CHE on the lives of families when their community recognizes their own potential, break their dependence on outside resources, and take ownership of their own development. Yesterday we visited a small village of about 120 families in which 60% of the homes are involved in CHE. Certainly they are still poor by our standards but now they are learning how to protect their families from illness, how to fully utilize their land to feed their families, the importance of education and how to plan and work together as a community. As we arrived at this small church, a group of youth were beginning to add an outdoor platform for their upcoming community Christmas program. 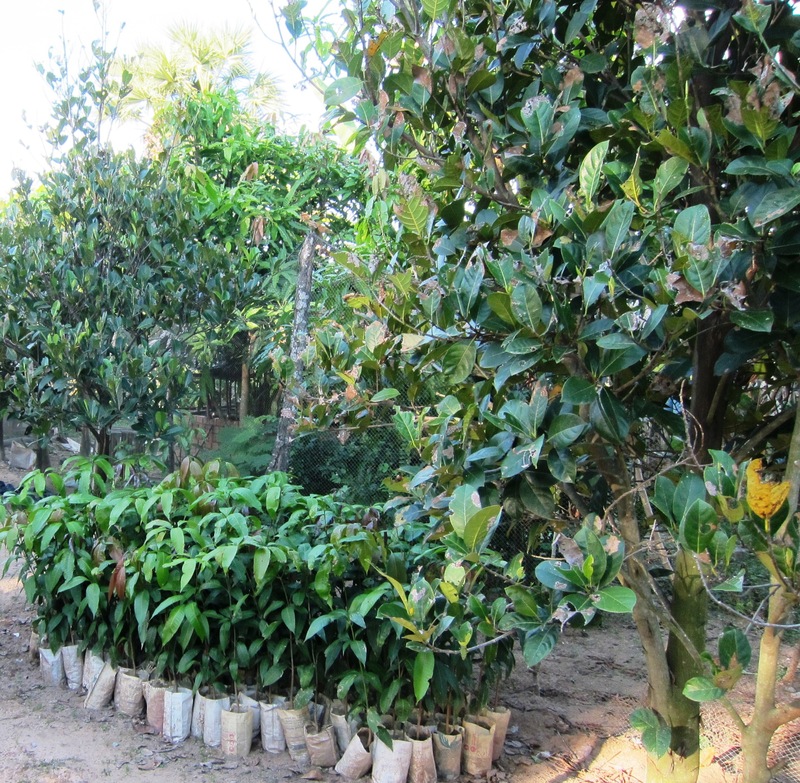 They were very proud to show us their demonstration garden, meringa plants, fruits, vegetables the mango seedlings they are raising for the community, and even a lovely little garden surrounding the falg pole created simply for its beauty and peace. 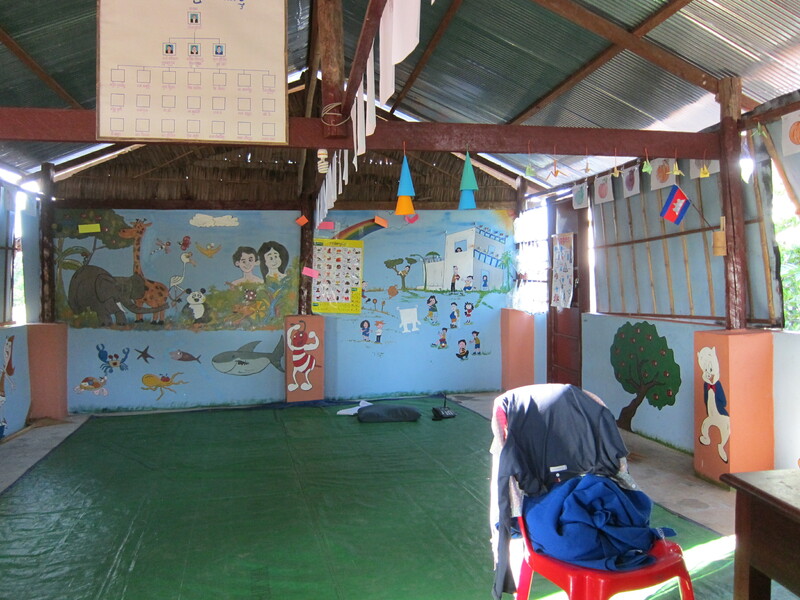 They also have built their own Kindergarten where about 30 of the community children begin their education. 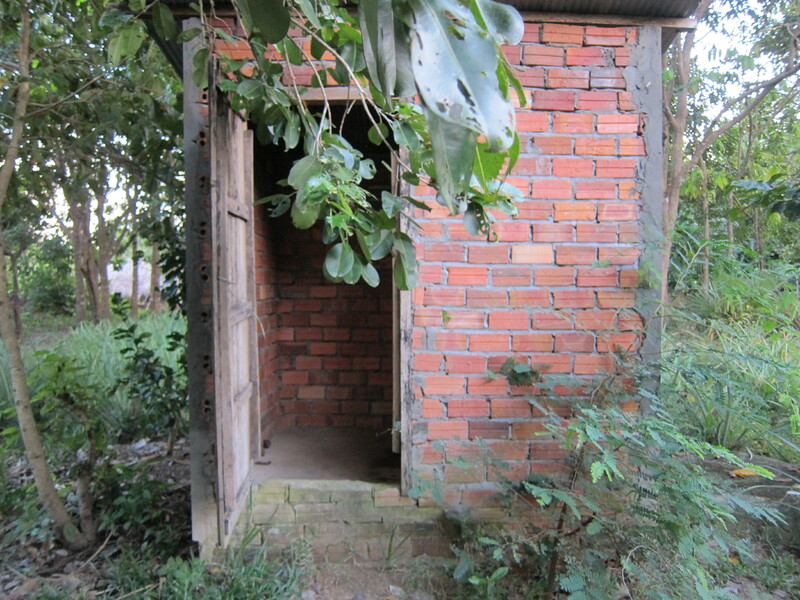 In this village the homes have a clean water supply, a brick outhouse, composting areas, a separate cooking area and receive regular visits and education from their CHE volunteers. We chatted with these three amazing ladies, the Pastor of the church who along with her husband, lead the CHE program, a young RHAC volunteer who is a teacher in the Kindergarten and provides regular health education to the youth and a CHE volunteer who supports her community. 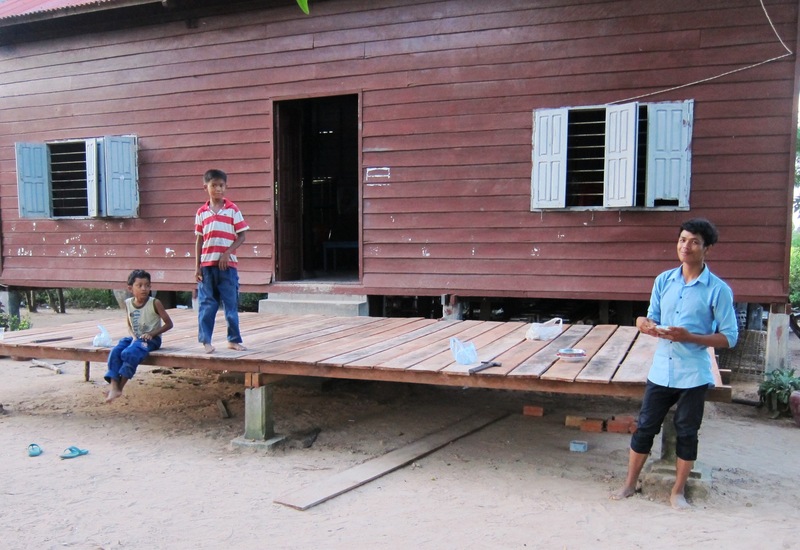 By the time we were ready to leave, the youth were very delighted to show us their completed platform. This village is clearly well on the way to becoming happy, healthy individuals enjoying the life the God intended for them in a community with the capacity to share their knowledge with other villages around them and making a difference in their country. The last two weeks have been pretty intense to say the least. The week before last Steve was off school for the Deepavali Holiday and I had some meetings set up in Singapore so we went down together hoping to fit some relaxation into a busy week. On Thursday and Friday we were graciously hosted at the home of Annelies, who is Director of Teaching at the Institute of Public Health, University of Heidelberg, Germany and we are so blessed to have her on our team for the Cambodia project. Bill and Sharon and Su Min were all in town as well and we had a very productive time reviewing the progress and just rejoicing in what God has done thus far. Steve carefully documented all of our discussions and by the end both he and Annelies were up to speed. Then came the difficult part, that of planning for the future. Our hope is that we can move the work forward to the point that it will be ready for pre-intervention research by May. Annelies has two students from the University of Heidelberg who are willing do the research as part of their Masters program. One will focus on evaluating the impact of the training we have completed while the other will carry out a baseline community survey prior to the formal implementation of the program. It will be a real advantage to have this type of academic credibility applied to the evaluation of the pilot area. 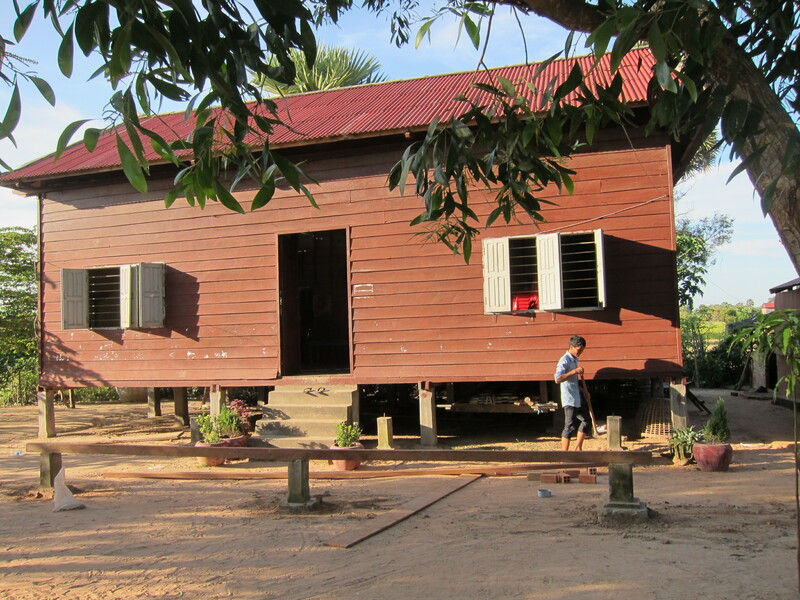 By the time we parted on Friday evening we had agreed on a timeline for the Cambodian staff to follow in order to ensure that we will be ready for the researchers who will arrive late May. With our team members spread around the world and all very mobile, it is not often that we can all be together for this type of planning and it was great. Su Min and Sing Yu hosted us at the Black Angus for a very lovely lunch on Friday before they headed off for New Zealand. Our friends Blossom and McDaniel are in the process of returning to Canada and we were looking forward to Friday evening dinner together to thank them for all their support and encouragement during our time here. While waiting for them to arrive, Steve received the sad news of his mom’s passing and later that evening we learned that Aunt Lil was also gone. With very little we could actually do until plans were in place for the funeral, we opted for some down time on Saturday just wandering and riding along the East Coast Park. After a very quick weekend at home in KL, Steve returned to school to get his year wrapped up before going to England and I returned to Singapore. Blossom and I began the daunting task of sorting, distributing and packing up their treasures and belongings collected over twenty eight years on various mission fields. Clearly yet another visit will be required before we are even near completion of that task. Ray Alary, President of TWR Canada was passing through on his way from India so we had a great opportunity to compare notes on the similar challenges and effective strategies in Africa and Cambodia and I look forward to ongoing opportunities to work together. I got some meeting time in at the office around my new role with Holistic Ministry which was also most pleasant and productive. This weekend we found ourselves very tired and yet so grateful for the amazing opportunities God continues to give us. I grew up just about a mile down the road from Aunt Lil and Uncle Stewart and my cousin Sandra is only a few weeks younger than myself so I have many happy memories of my times with all of them. Many of those memories were formed on the beach at Ipperwash where they rented a cottage each summer and several times took me along. Last summer, I had the joy of seeing Uncle Stewart and Aunt Lil surrounded by their four grown children and their spouses, sixteen grandchildren and fifteen great grandchildren as they celebrated their 60th wedding Anniversary. It was a happy day for everyone, but I am sure no one enjoyed it more than Aunt Lil, whose greatest joy was always being with her family. My dear Aunt Lil, my Mom’s youngest sister and the last of the seven children of my grandparents, Robert and Lil Barr, has now gone to be with her heavenly family. Friday, Nov 16 truly was the end of each of our parents’ generation as my husband’s mother passed away earlier the same day. Our thoughts and prayers are with Uncle Stewart, Sandra, Ian, Donna and Judy and their families as they say their good-byes to a wife, Mom, Grandma and Great Grandma who was first and foremost committed to her children and grandchildren. Lil was their rock and never one to back down from a challenge. She faced the struggles of life, including the last few years battling with illness, with courage and persistence. She taught us all that when bad things happen, you find your strength in faith and family, you dust yourself off and remind yourself of all the good things you still have, and you get on with your life. 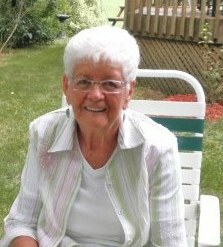 Her own life was a blessing and an encouragement to everyone she knew. Love you always. My Mom passed away last night. 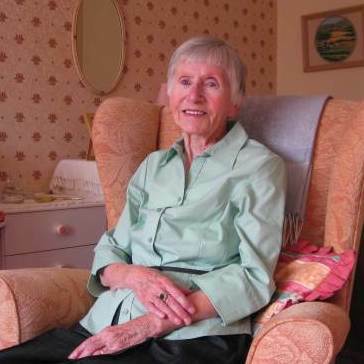 She was 93 and had enjoyed relatively good health until a couple of years ago when her hearing and sight began to decline. She was the last of our four parents to die, and with her death that generation and its memories is now lost to our families. Mom was born in 1919 in London, England to middle class parents. Her Dad, Hugh Blakeman, was a building contractor and she and her sister Constance lived in Wembley and Dollis Hill, relatively affluent neighbourhoods in London, England. Mom was on holiday in Italy with her mother and sister when she bumped into Dennis, an acquaintance from London and began a romance that led to her engagement. Dennis had enlisted in the air force as a pilot in what everyone knew would shortly be conflict in Europe. Mom enlisted as well and was soon serving in the south of England in the secret radar installations that dotted the southern coast. Soon German shells were dropping all along that shore in an effort to disable this vital defense line, and Mom spent long days and nights in bunkers manning the small green screens that identified incoming aerial attacks. The WACS, as these brave young women soldiers were called, were trained to distinguish between the larger German bombers and the smaller British fighters by the shape and size of the blips on the screen. For every smaller blip that disappeared, another British plane went down. One of those blips that disappeared one night over the English Channel was her fiancée, Dennis. There was no time in those days of wholesale destruction to mourn the death of one airman and the marriage dreams of one female soldier. Friends and family members were dying daily all around you and life seemed to be not much more than a matter of mere chance; where you happened to be standing or sleeping as the bombs rained down in an unending cascade. Along with the inevitability of death came an almost desperate attempt to affirm life and cling to whatever chance it seemed to offer you of future happiness. In such a context Mom and Dad met. She was singing in the mess tent that served as an entertaining venue in the rare evenings when they weren’t being bombed. He was a young army officer, just one of thousands that were being assembled in the south of England getting ready to be shipped to Africa to stop the Axis advance there. He strode in to the back of the mess hall one night, listened for a minute as Mom was singing on the stage, turned to his mates and said, “That’s the woman I am going to marry.” Two months later they were wed. The following day he shipped out to Africa. When that campaign was over he was reassigned to Ceylon, and then to what is now Bangladesh to stop the Japanese advance through Burma. He and Mom didn’t meet again until the war was over, almost five years later. Post-war England was a difficult place to live. The war had been extraordinarily destructive to Britain. Food was still rationed and fresh fruit almost impossible to come by. In such circumstance my Mom and Dad began a family. Rosemary was born just after the war in September 1946, Wyn came along 15 months later, and I was born 17 months after that. A fourth child, Henrietta died after just four days and is buried in Colchester, where Mom and Dad had settled. Although we lived in a nice house on Turner Road, and Dad had a good job, the chances for promotion were limited and the opportunities for adventure even more so. Emigration to Australia and Canada was actively promoted by England as a way of dealing with the unemployment problems facing Britain. Passage to Canada was the princely sum of $1500 for a family of five. Passage to Australia was free. Mom reasoned that anything being given away wasn’t worth having and decided on Canada instead. We emigrated in 1955, landing in Toronto and living in the attic of family friends until we could find a flat of our own on Dufferin Street. Mom and Dad loved Canada and did very well there. The opportunities for an entrepreneurial salesman were vast and immigrants like themselves were common in those days. They became good friends with Irene and Dino Voyatzis, neighbours in the Don Mills community where we moved next. Both then moved to the new community of Parkway West, just west of Scarborough in Toronto and both joined an amateur drama group that gave Mom an outlet for her dramatic and artistic talents. She sold real estate for a while and was very successful at it and worked for Kofflers, a local drug store that went on to become Shoppers Drug Mart. She enjoyed the life that Dad’s increasing salary afforded them. In 1968 Dad’s company closed its Canadian operation and in order to preserve his pension they moved back to England, settling in Lincoln where Dad retired. It was there that he passed away in 1995, succumbing to the cancer that had started in his lungs and progressed to the bone. Mom soldiered on for 17 years without him, but a partnership forged in such circumstances as theirs cannot easily be replaced. Mom gradually withdrew from the world and as her eyesight dimmed and her hearing went became more and more isolated. I had the joy of visiting with her three years ago and had a lovely time taking her out to the pubs and walks where she used to go with Dad. But there was always a longing in her spirit for the man that she had shared such an adventurous life with; a hole in her heart that could not be filled with anyone or anything else. A year ago Pam and I were able to visit with her again, but she could no longer endure car rides to anywhere and consoled herself with small walks just beyond the nursing home that had been her only home for the last eight years. She was grateful for our visit, but I knew in my heart that it would be the last I would ever see of her. Lately the phone visits have become more and more infrequent as she no longer had the physical strength to get to the phone or hear what was said when I called. When my sister wrote that she had been taken to hospital five weeks ago I began preparing for what I knew would be the end. But even at 93 and after such a full life, these things still have the power to take you by surprise with their sudden intrusion into the ordinary events of your own life. My mother was a feisty and often abrasive woman. She was as stubborn and strong-willed as anyone you are ever likely to meet. But she was also beautiful and graceful, artistic and loving. It is to my Mom that I owe my love of literature, drama and music. My Dad loved her for her wild and willful determination to be her own person whatever the consequences, and I guess I did too. I will miss her; the last in our family of the ‘heroic generation’ that fought a war to save a civilization from the dominance of tyranny. Her own personal war has at last come to an end. Rest in peace, Mom. This past election in America may well prove to be a watershed in the Christian Church. Ever since the heady days of Ronald Reagan – darling of the Christian Right – evangelicals have in increasing percentage backed the Republican Party. In this last election evangelical Christians actually voted for Mitt Romney in a larger percentage than did Mormons themselves according to a recent article in Christianity Today, a statistic that is testimony to the desperation of the Christian Right, rather than any revelation concerning the purity of Mormon doctrine or its alignment with accepted Christian theology. I read an insightful piece in the Washington Post this week about a typical campaign worker for Romney; a devoutly Christian woman who is more than simply disappointed by this past week’s events. She is shattered; her worldview coming apart at the seams as she sees what looks to be the end of Christian America. The writer was not critical of her view; indeed he seemed profoundly moved by her plight and wrote from a sympathetic perspective. I too grieve for her situation, but from an entirely different perspective. My view is informed by decades of working with Americans in a number of Christian endeavours over the years and is coloured by lifelong friendships with Americans based on a common faith in our Saviour. They are lovely, hard-working and dedicated people; but they seriously misunderstand their role in Christian history. Americans are justifiably proud of their secular history; it is storied and heroic. Although its founders were not Christians in the strictest sense – their theology was more Masonic and Deist than anything else – there were enough Christians among them to ensure a rich heritage from which a modern evangelical tradition has arisen. This has led to the view among many in that nation that God has chosen America to be His special people in a way not experienced before in human history. Mormons would go even further and claim that the lost tribes of Israel actually wandered over to North America, making America the inheritor of the eschatological promises to the Jews. Not only does this fly in the face of sound exegesis of the Bible, it also contradicts much of human history. Alexander the Great can lay better claim to being the chief architect of the spread of the gospel, since if he hadn’t conquered the known world there wouldn’t have been a unified language to translate and propagate the gospels. The Romans have equal claim as their conquest of the Mediterranean and their engineering superiority provided the roads for the gospel to travel freely. It was the monastic order, not the Americans, that preserved the gospels through the darkest ages of barbarian destruction, and it was the Germans that gave the world the Reformation that propelled the gospel to prominence again. Finally it was the British, not the Americans that carried that gospel to the far corners of an empire on which the sun never set. Certainly post-WWII America has been the flag-bearer for Christ, but that was a relatively short-lived period of Christian history as already missionaries from Asia outnumber Westerners and have for more than twenty years. More to the point, however you see America’s involvement in the spread of the gospel, it is still not in charge. The Holy Spirit overseas the development of His church, and He does not cede His work to any nation. Christ was not Caucasion; His church has no nationality. This is not to discount the contribution of America to the cause of Christ, but only to put it in perspective. Those that see the destruction of the church as coincident with the decline of the Republican Party or even the decline of America itself forget that it was the Christian Left that elected Jimmy Carter to the presidency (still the godliest man to ever hold that office regardless of how you view his political savvy). In Carter’s day evangelicals were evenly divided along political lines. Now they vote four to one for the Republicans, a party that is seen as being increasing unconcerned about the plight of ordinary Americans and increasingly committed to a program of toxic “rugged individualism” at the expense of communities and social cohesion. Let the 47% rot in their hovels; I want to get rich! It is a profoundly disturbing trend. Bryant L. Myers in Walking With the Poor writes, “As Christians we can no longer simply view the world as a collection of individuals. Instead we need to view each individual as embedded in families and communities as well as being participants in the whole gamut of institutions – economic, political, cultural and religious. This [holistic] view of self will not validate metaphors like the lonesome, self-contained ‘I don’t need help from nobody’ cowboy; the entertainer who ‘does it my way’; or the entrepreneur who gambles with corporations without regard for the people that work in them and contribute to their true value. It will not create the full human self of the Bible” (Myers 44). Evangelicals in America are in for a dry spell politically. They have cast in their lot with a party that is dominated by ‘old, angry, entitled white men.’ I dare say that they are finding that not only are the demographics against them; the God of the Bible is as well. A humbler view of their own position in the development of God’s kingdom on earth aligned with a more compassionate understanding of the hurting communities around them will bring the church huge rewards in terms of godly witness to the nation they love and long to see fulfill its promise. They may at present feel like they are in the wilderness. 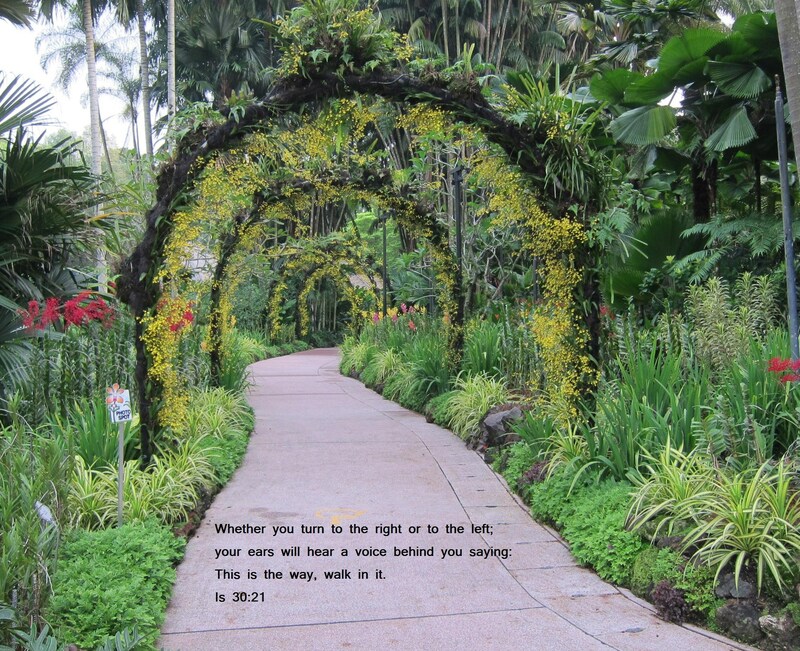 But it was out of the wilderness that God spoke, and it was in the wilderness that Christ began His earthly ministry. In other words, we need to pray for a genuine spiritual revival. God bless America. We live at the end of a dead end street and there are times when the half kilometre stretch of the road before you enter our housing subdivision can get very busy. There is a large hospital, two major hotels and a strip mall in that short strip. However when we headed out Sunday evening we faced near gridlock and it took almost twenty minutes to make our way through. This week is a major Hindu holiday so we assumed that there was a huge celebration at one of the hotels. We only learned the real explanation from this newspaper article this morning. 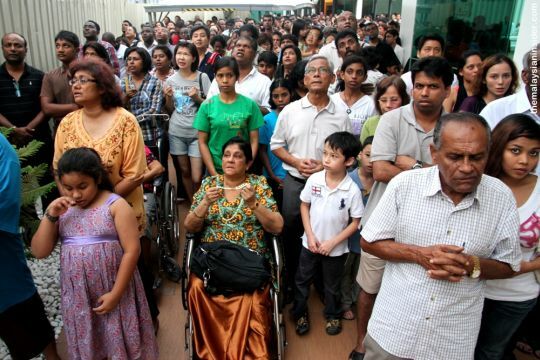 Hundreds of devout Catholics and a smaller number of curious onlookers are continuing to gather at the Sime Darby Medical Centre here to see for themselves an image said to resemble the Virgin Mary. The mysterious image of the figure revered by Catholics was reported to have been spotted a few days ago on a window pane at the hospital. In Catholicism the Virgin Mary is identified as the mother of Jesus Christ. Many came today to see the image for themselves as news continued to spread by word of mouth or on the social networking sites A few of the hospitals staff were seen directing traffic as cars streamed in and out of the mildly congested road outside the hospital in an orderly fashion The crowd prayed fervently and sang before the image as they stood together in a narrow uncovered space outside the hospital’s outpatient block. 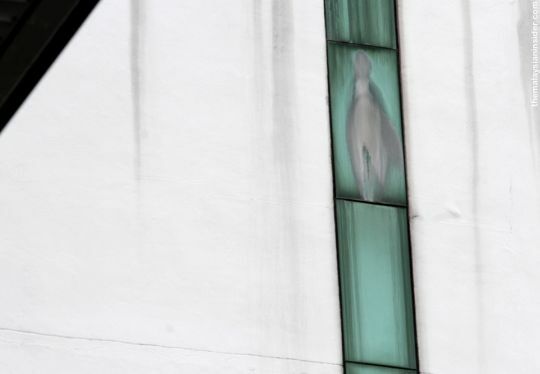 Some were seen snapping pictures of the image said to be of Virgin Mary which appears on the third pane of a vertical stretch of windows on one of the upper floors of the hospital after they recited prayers. Most of the crowd who spoke to The Malaysian Insider appeared convinced that the image is an apparition of the Virgin Mary with some looking visibly moved. A second image has also been sighted just one pane below that bearing the likeness of Virgin Mary with some saying that the new silhouette looks like Jesus Christ on a cross. Others however were less certain. One of the highlights of any year is the drama unit that allows me to unwind a little and have some fun with the students that I teach. A pre-university school like ours is pretty stressful as there is a lot riding on the line for these kids. Entrance requirements for quality universities are pretty high and the pressure to nail those marks can drive our students to the breaking point. Drama is a chance to let some of that pressure out through assuming a character and escaping from the endless routine of tests and assignments. Asians love drama; their culture is rich in it and with their excellent retentive skills they do well at committing their parts to memory. They also love dressing up, and the costumes are quite often very creative and colourful. Last semester I started a Drama Festival at CPU to take some of that acting talent and put it on display in a larger setting so that parents and peers could come and watch. It was a huge success and it is no surprise that we are doing a repeat festival this term. The festival itself will take place on Monday, but as you can imagine there is a lot of preparation that has to go into an evening like this. The venues were booked four months ago and I have been planning this unit for at least three months. A month ago we started studying the play and this last week has been all about blocking out the scenes and coordinating the movements. This Saturday afternoon I left room for those who were keen to practice to come in to the school and see how it felt to use the room we have been assigned. I love this aspect of my job. I love the joy that I see in students as they work together with their peers. This group you see pictured here come from Malaysia, Iran and Kyrgyzstan, yet they practiced together like they were brothers and sisters and then went off to a meal together. I love that. Four months ago they were barely able to say their name in class; they were so shy. Now they are acting out Shakespeare. What a great privilege it is to be their teacher through that incredible journey! 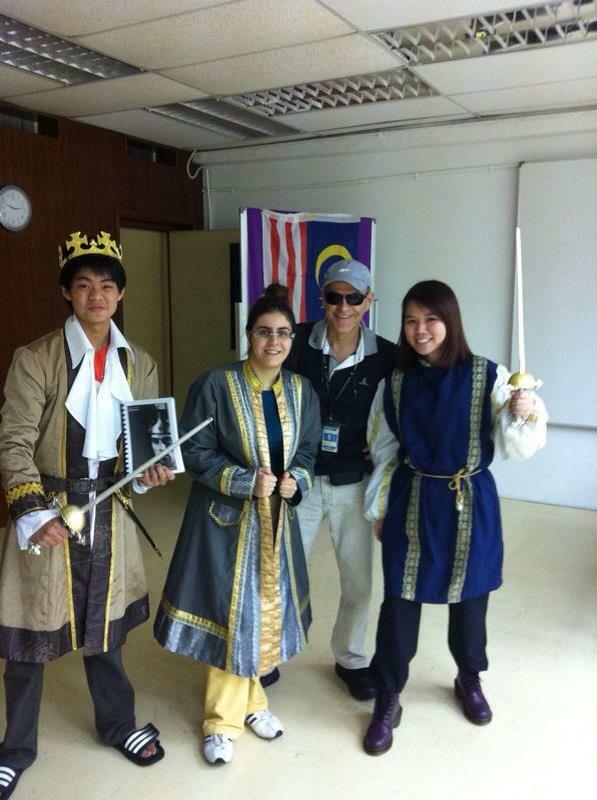 If you are planning on coming to this year’s Drama Festival, it will held on the main campus between 6pm and 9pm. There are different performances in LT1, LT2, LT3, and DR2 (right beside LT4 above the construction zone; just follow the signs). If you come to see my classes’ perform, we are in DR2. We are planning to stage the entire play in three hours, and you can come for as little or as much as you like. We will start at 6pm, and we will end at 9pm. Check with your friends to find out the time of their performances. Whichever venue you go to, have fun, encourage your friends and applaud their efforts. See you there!